It has been over three decades since the first desktop computer was created and designed to cater to the calculating and organizing needs of people. The regular desktop computer, including the monitor and CPU is big and heavy, that you can’t carry it around when you travel across the countries. The ultimate gadget for the traveler who is obsessed with computers is the OQO Model 02. It’s an ultra-portable computer that weighs less than 1lb., has a frequency of 1.5 GHz, a hard drive of 60GB, and a RAM of 1GB to run Battlefield 2 or any application that uses a lot of memory effectively and efficiently. If you want to use Vista Ultimate as your operating system then you can have all these at around £1,156. It is relatively more affordable than any equally extraordinary gadget out there. The OQO Model 02 is the model replacement of the OQO Model 01. The 02 is remarkably faster than the 01 because it has an improved graphics and CPU processor. One input device that it uses is a digitizer pen for touch screen. Another input method is a track stick pointer that can be found on the keyboard. There is also a part on the right corner of the screen which is touch sensitive to scroll up and down through the pages on the web that you are trying to view or just plain documents. It has a keyboard which is just as efficient as a normal keyboard could get. The keys of the keyboard are not too small and not too big for your ten fingers. The device measures 5.6 x 3.3 x 1.0in and has a display of 5 inches. It uses a Bluetooth 2.0 with stereo headphone support and a native resolution of 800×480. It also uses a Virtual Encrypted Hard Drive, and uses VGA, HDMI, & DVI up to 1920×1200 as its external display support. Its video performance is powered by a VIA VX700 which is GPU-integrated and is with dynamically allocated memory. It enables you to zoom in small text or images as well as zoom out up to 1200×720. The most outstanding part of the 02 is its wireless connectivity capabilities, which enable you to use not just one connection, but both WiFi and Bluetooth at the same time, with no conflicts. It includes a retractable whip antenna and nine integrated antennas for Wireless Wide Area Network. You can also avail this drool-worthy device for as low as £888.84 which features a 1.2 GHz, 512 MB, 30GB, and XP Home, but is still very functional and efficient as the more expensive ones. 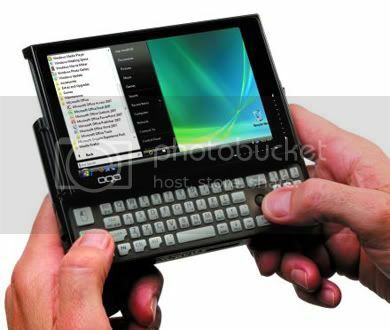 PDA’s, tablet PCs, laptops or notebooks, and smartphones are nothing compared to this mobile desktop. Even though it features Windows as its operating system, and I own a Macbook and got pretty used to it, I sure want to own an OQO 02 someday.